Multiple events in my life last Sunday conspired to make it difficult for me to sit at my desk and write as I am writing now. Sunday came first with the snipping of the tip of my middle finger (left hand) with my rose clippers. It has been difficult to write with only one hand. The bleeding came with an ancillary bad back that had me not being able to go up or down the stairs of our bedroom. A respiratory infection, brought about my highfalutin arthritis medicines and arthritic pain, in spite of my miracle drugs, all kept me out of commission during the day. Insomnia kept me awake at night. Relief seems to be almost here as I hunt and peck with the left hand (the finger, a smaller one now, is healing just fine). 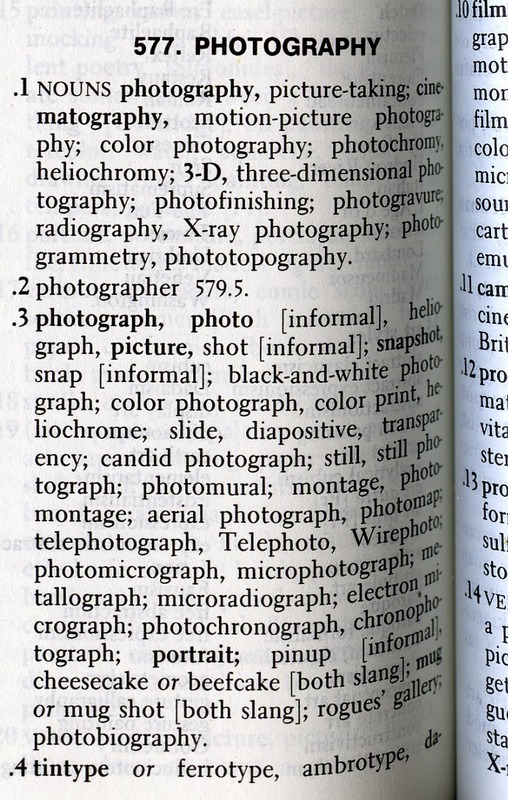 This last week I have been thinking about photographs and as many synonyms of the word as I could. 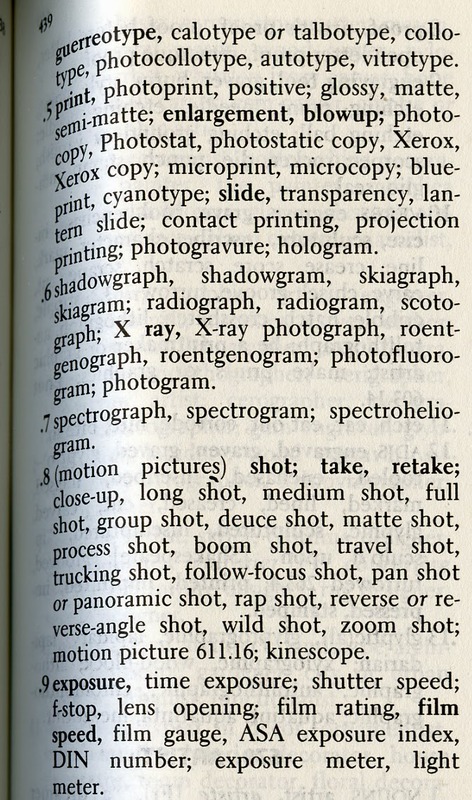 I have enclosed here two scans of reference to those words as in my Roget’s International Thesaurus – Fourth Edition (1984). My thesaurus is much too old to include selfie or capture which are words of this century. In that last century when I attempted to parade about town as a an artist who displayed photographs in galleries I absolutely despised art lingo and what I thought was the pretension of calling one’s photographs images. Now with selfie and capture, plus, of course Instagram, image doesn’t sound so terrible. But I do prefer photograph and with tongue slightly in cheek I sometimes call myself a scanographer and my rose scan giclées (another new Word) scanographs. Spanish, rich in words most of the time does not always do justice to the words of my English vocabulary. I thought there was no equivalent to snapshot or snap but I was wrong. In Spanish we call such a photograph an instantánea. You get the idea. When magazine photography provided me with a comfortable income in the 80s and 90s there was a constant see-saw between the slick, well exposed photographs and the more edgy ones of avant-garde fashion world. Fashion art directors liked to use a word (I loathe it) in this fashion, “I need some edgy photographs with lots of attitude.” I was never able to figure out what they meant by attitude. In the several assignments I obtained from the on again and off again Saturday Night I was asked to take pictures like the ones in Vanity Fair or pictures (with no styling or lights) as if I were a fly-on-the-wall. Many times that snap look could be achieved with a Polaroid or with the blast of flash on the camera. All that, is long gone and dead. The camera phone and all those devices that capture everything except perhaps our souls. There is a new movement by a younger generation tired of digital perfection. That diffuse glow is now tarnished. 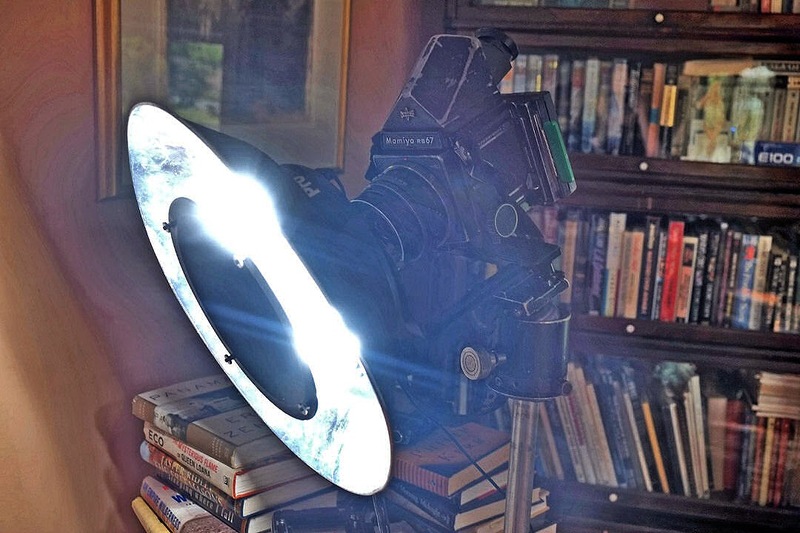 With plastic cameras, plastic lenses, badly expose film and or re-manufactured Polaroid they are attempting to bring back surprise. That it can also bring failure is considered an asset. I would like here to expose those reading this to a quick little personal story of the snapshot. 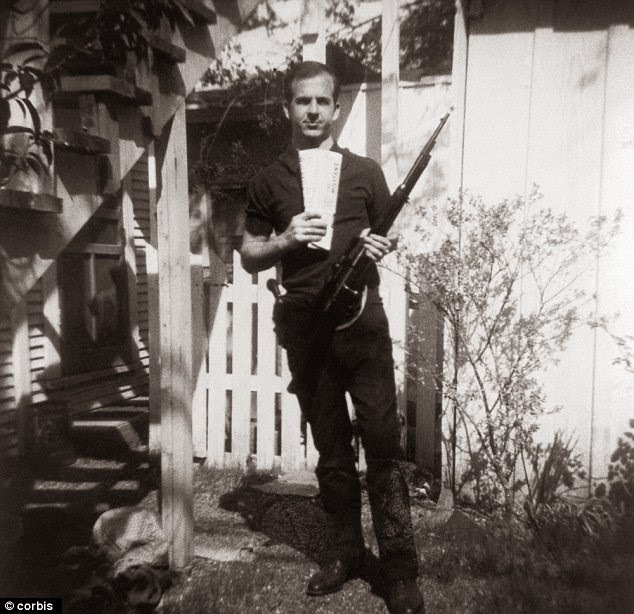 For me the first one has to be the picture of Lee Harvey Oswald. This is a snap. My guess his wife Marina may have taken it. 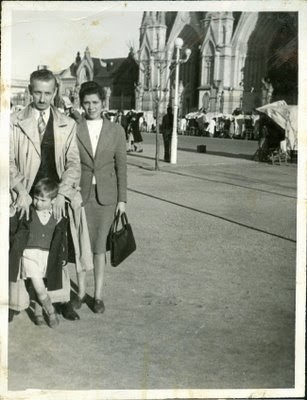 Second there is this picture of yours truly with his father and mother taken in the Argentine shrine, Nuestra Señora de Luján. I have no idea who took the picture but I am sure it was one of those box cameras with an uncertain viewer. 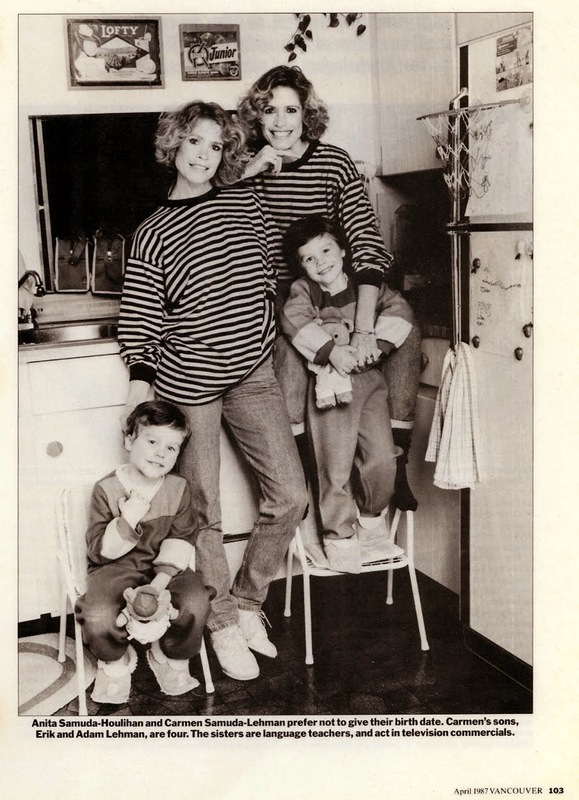 The third shot of two sisters who happen to be twins, I took in the 80s. I was told by the art director to make it look like a snapshot. I took it in the kitchen; I fully lit it and used a big camera. It does not look like a snapshot. Then there is this picture which I took last week. Is it a snapshot? Lisa, my subject was sitting on the left of the second photograph. 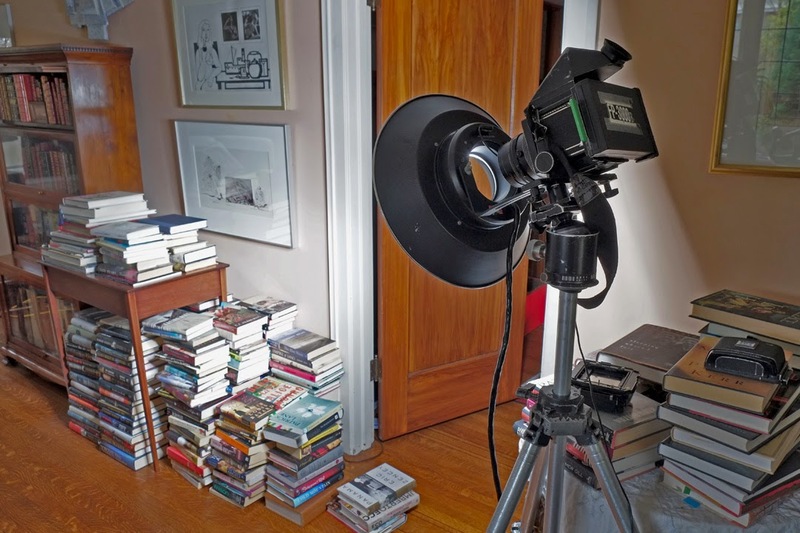 On the right hand side there is a Mamiya RB-67 Pro-SD shoting through a Profoto ring flash that I adapted some years ago to be charged by a Norman 200B pack. Not seen in the picture is the fact that my camera lens is swung to one side so that when I took the picture the camera would see the edge of the flash. Most important, mounted behind the camera is my old Polaroid back. For the snap you see of Lisa I used the-not-quite-yet discontinued Fuji FP-100C Instant Colour Film. The resulting picture, which I planned with a lot of thought looks like a snapshot. Is it?